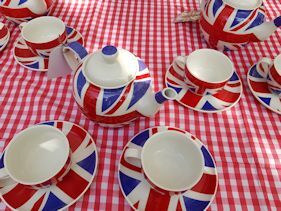 The sun was shining on the Fes-Tea-Val British lifestyle festival to celebrate National Tea Day www.nationalteaday.co.uk on April 21st. 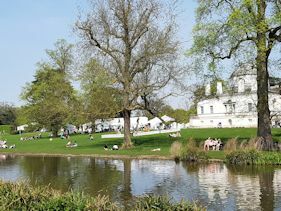 Chiswick House and Gardens http://chiswickhouseandgardens.org.uk was the ideal venue for the event with its landscaped gardens. This house, built between 1726 and 1729, is one of the earliest and most important neo-Palladian villas in England. 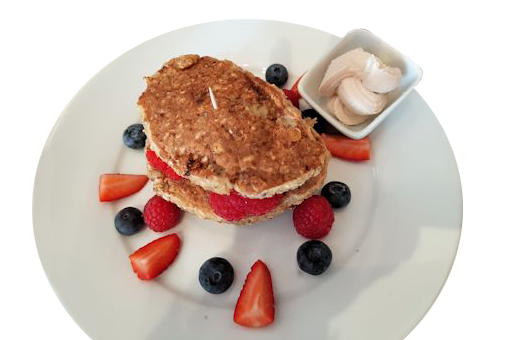 Although tea was the main focus, we were delighted to find a wide range of ‘free from’ food available from waffles, vegan burgers to gluten free and dairy free cakes. We made a beeline for Nemi Teas www.nemiteas.com where we sampled an excellent English breakfast Assam tea grown in the Borengajuli Estate in India. We enjoyed the robust and full-bodied taste. All the teas are available in teabags or loose leaf, but we opted for the loose leaf. 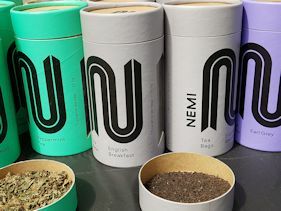 Nemi Teas describes itself as a social purpose business because it helps to rebuild refugees’ lives by creating employment opportunities. Tea varieties include Spicy Chai, Cardamom Chai, Peppermint and Green Tea. You can find the tea in Oxfam shops www.oxfam.org.uk as well as various cafes and food events or buy online. Looking for unusual tea sets? 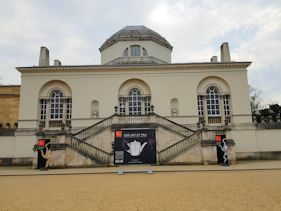 Britain Street www.britainstreet.co.uk was showcasing its iconic union jack themes tea sets. Just the thing for garden parties! 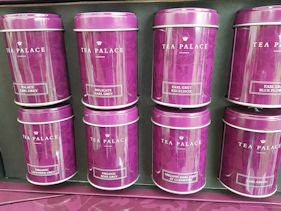 Next up was The Tea Palace www.teapalace.co.uk which was launching organic versions of its classic blends. We sampled Oriental Berry which was refreshing. 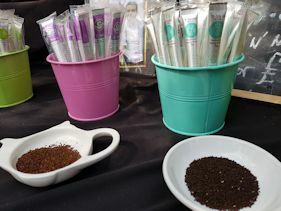 The company offers over 120 loose leaf and infusions as well as bespoke blends. It created a special Chiswick Blend for the weekend containing nuts. A more unusual tea application was T-Sticks www.t-sticks.co.uk where the T-stick is placed into a cup or mug of freshly boiled water, stirred for a few minutes depending on how strong you like your tea. You then shake out the excess water and discard. What a clever idea especially if you’re on the move. Flavours vary from The Earl’s Favourite, Breakfast Brew, Moroccan Minty Green to Rockin’ Rooibos. You can order online. By now we were feeling peckish and were delighted to find so many ‘free from’ foods available. 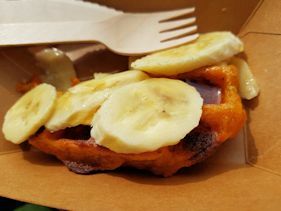 Our first choice was a vegan dairy free and gluten free waffle from Waffleland www.waffleland.co The dough is made from sweet potato and was available with several different toppings, depending if you want a sweet or savoury waffle. We opted for banana and maple syrup. This was a real treat – I can’t remember the last time I ate a waffle. You can get a chance to have one as Waffleland will be at many foodie events coming up including the Free From Festival on Monday 28th May www.freefromfestival.co.uk at Old Spitalfields Market, London. If you have a waffle machine, you can make your own as the vegan gluten free dough is available to purchase online. 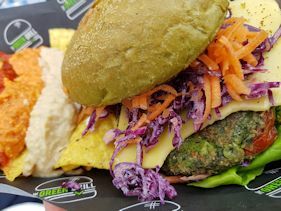 Looking for a more substantial meal, we found The Green Grill www.thegreengrill.com offering a range of vegan burgers with unusual coloured buns. As I am gluten free, I was unable to eat the buns, but they offered me a salad instead. I opted for the Green Monster burger made from sundried tomatoes, spinach, peas, red bell peppers, broccoli and onion – it was yummy and accompanied by tortilla chips with hummus and salsa sauces. The buns are dyed using dehydrated products such as matcha, beetroot, charcoal and turmeric. Ray tried the bun which he found very flavoursome. This business is only three months old and, judging by the number of people crowding round the stall, is doing well. The Green Grill will be attending events all summer and plan to launch online sales in September. 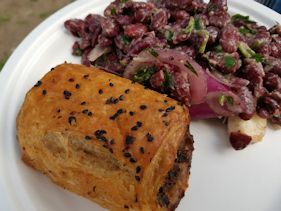 Meanwhile, Ray enjoyed a vegan mushroom sausage roll from the Hush Hush Chefs stall www.hushhushchefs.co.uk – he said the pastry was crispy and flavoursome – a real treat. 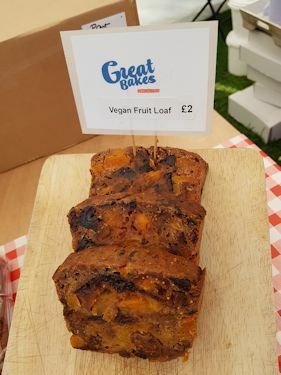 To round off the afternoon, we found Great Bakes www.greatbakes.co.uk which served a vegan, gluten free and sugar free fruit loaf. This loaf was packed full of fruit such as apricots, raisins, dates. It was delicious, not over sweet and the cake was moist, which is commendable because often vegan and gluten free cakes can be too dry and crumbly.